The most productive series of snow storms in 15 years is ending tonight. Now it rains. If the forecast holds true more rain will fall for days as we watch the beautiful hills of piled snow melt into sad mounds. The city seemed to abandon Chicken Ridge this weekend as the snow formed foot deep drifts between the taller houses and anyone with sense and time left their cars rest under piles of snow and walked to their destinations. I hung up the shovel after running out of places to pile it. These big storms bring a blessed simplicity along with all that white beauty. 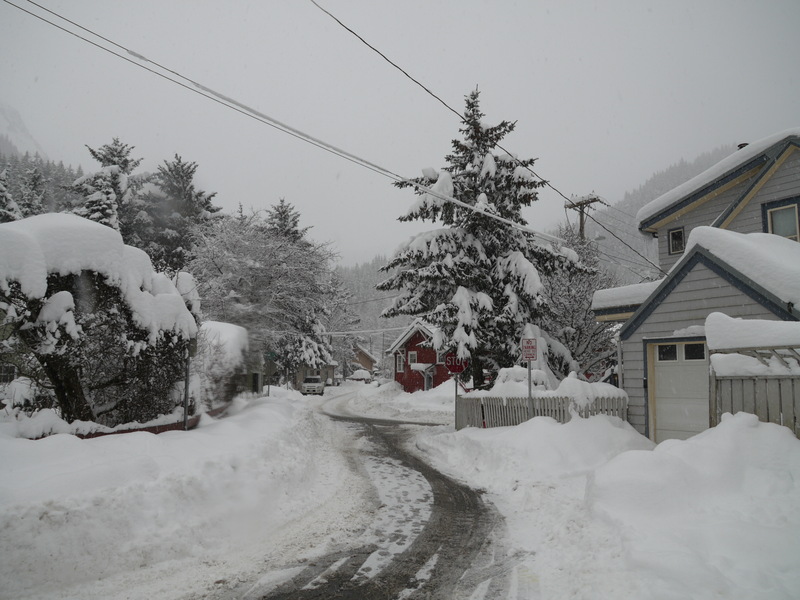 Now the city begins a race with winter to remove the snow overburden from neighborhood streets before the next cold snap turns the berms into cement hard barriers. Already I can hear the power scoops and dump trucks beeping away downtown when Sonny Boy Williamson pauses between cuts on the album playing on our computer. Aki hides out downstairs for she cares little for the blues or the coming rain. 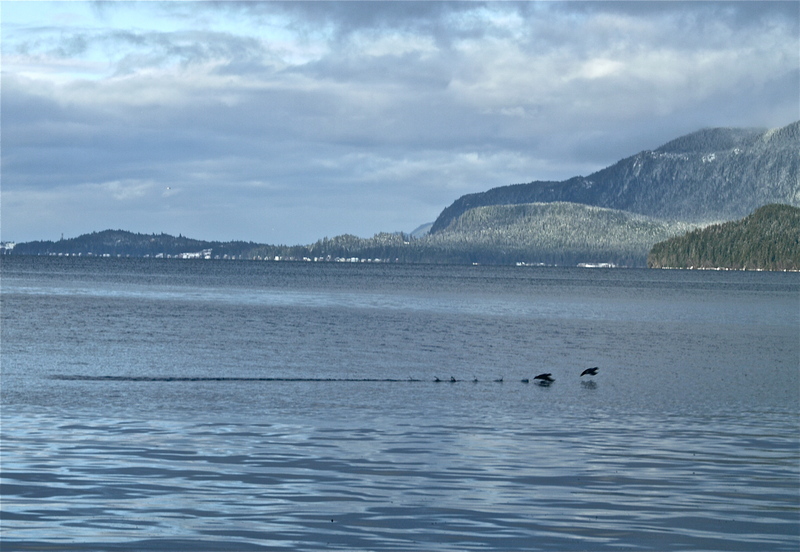 This entry was posted in Aki, Dan Branch, Juneau, Kwethluk, Nature, Southeast Alaska on January 30, 2012 by Dan Branch. From this Mendenhall Wetlands access point we can see Juneau’s only four lane highway and the trash dump. Five hundred meters away people shop at Walmart. Placing that behind us we plunge into the deep snow covering the portion of the wetlands above the high tide line. The snow fall that started up again last night persists so Aki has to shake often to avoid turning from gray to white. I picked this hike because it takes you over ground washed clean of snow by last nights high tide, which only peaked 7 hours ago. Unfortunately the storm has already replaced much of what was lost to the tide so we must slog our way down to Gasteneau Channel. With everything covered in white I can’t spot all the walking hazards and soon manage to submerge one boot completely in brackish water. Aki avoids these pitfalls but refuses to walk ahead of me to show the way. That would mean breaking trail in the soft snow. Hoping to find it easier going I start across a wide mud bar sporting only a skim of snow. Aki looks doubtful but follows along until my boots sink in several inches of goo to release a smell that could have inspired Dante to write the Inferno. We are halfway across the bar so I push on to higher ground carrying Aki until we reach dry snow. Both of my boots are soaked now. 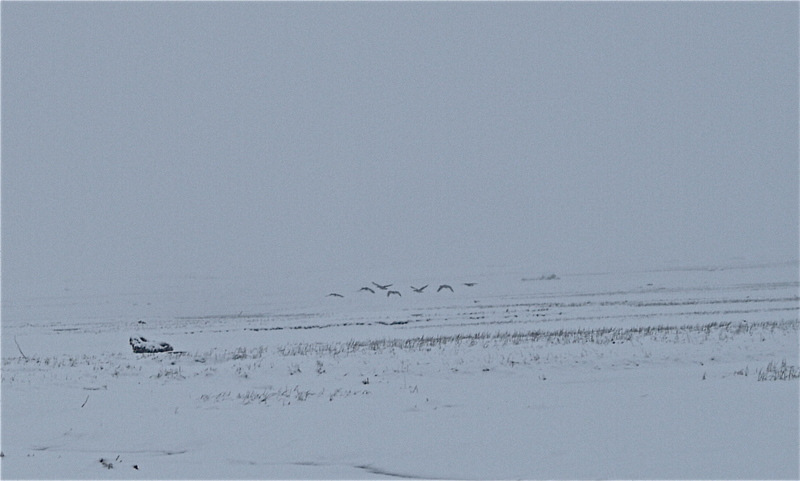 Moving around one of the small spruce islands on the wetlands I spot seven Canada Geese hanging out ahead. When I slip on another patch of stinking mud they begin in cackle. 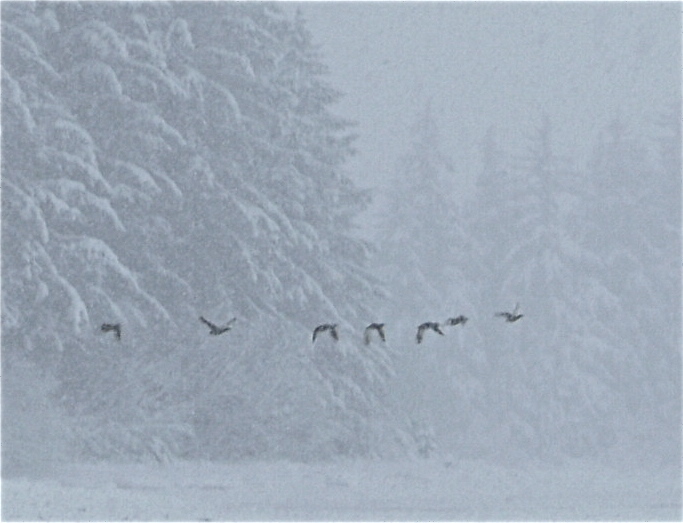 In minutes they are airborne, quickly disappearing into a wall of falling snow. Later we will watch 300 more geese break cover and flee, flushed from something on the far side of the wetlands. My head was down looking for deer tracks when the big flock of geese took flight. I had just seen on the horizon three or four large animals moving slowing away from us. In this light damped by constant snow it is hard to gauge size and distance but they could have been deer or dogs. Snow accumulation is flushing some of our deer out of the old growth forest. Early each morning they can be seen walking down city streets to the Gasteneau Channel to feed. I’ve heard takes of deer surviving on sea weed exposed at low tide so maybe that is what draws them to the sea. There is nothing for them to eat today on this wilderness of snow covered mud. 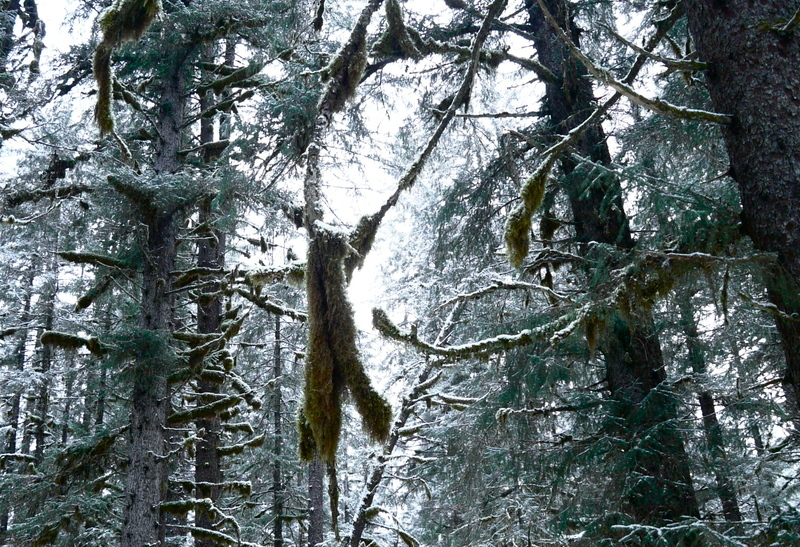 This entry was posted in Aki, Dan Branch, Juneau, Kwethluk, Nature, Southeast Alaska on January 29, 2012 by Dan Branch. Its been all snow and no rain since the last hard freeze—that one that firmed up the beaver flooded trails through the moraine. 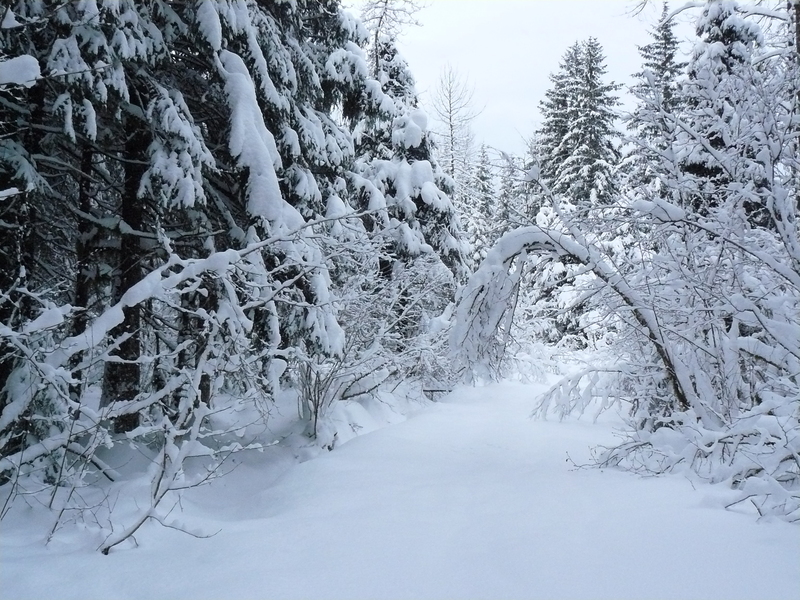 Not knowing when a Pacific low might ruin everything with warm temperatures and rain we return, finding more than a foot of unsettled snow covering the trail. Fortunately Aki’s other human skis with us. The dog, no fool she, allows us to break trail so she can trot along behind. I wouldn’t mind the sun to blink through storm clouds to light up the mountain tops or this abundance of snow. But today the sun leaves us alone in a land of white and gray. When the trail begins to parallel a cashew shaped lake we leave it and plow into the thiner snow covering the ice and move toward the lake’s far end and the beaver village. It has been awhile since I skied in such deep stuff and it takes me time to fall into the slow backward leaning style that turns the task from work to meditation. Still we are happy when we come upon recent snowshoe tracks that offer a packed surface for skiing. Interesting animal tracks cover the beaver village grounds. Some were made by predators. We find a “U” shaped trough amount 20 feet long. It stops at a point where a beaver could observe the lake we just crossed without exposing himself to view. Aki finds it too interesting to ignore. Dropping her nose to the trough bottom she sniffs her way from the observation post to its other end. I head over expecting to find a hole in the ice for we stand over the deep water between two beaver dams. Then a great black Labrador Retriever comes galumphing through deep snow to visit Aki. Wanting to avoid further disturbance of the beaver’s ground I lead Aki and her new friend out to the lake. Skiing on we find a path laid down by other skiers and follow it through frozen flooded lands to another lake. Our presence disturbs a roosting hawk which launches itself up from a lakeside spruce, gains altitude, gives three quick beats of its boxy wings to fly directly over us. In this land of the eagle we rarely spot the hawk. Last weeks storm managed to penetrate the Troll Woods canopy but only left six inches of snow on the ground. Looking for an easier transit we leave the lake for the woods and take a short cut back to the car. It take fie minutes to pick all the snow balls off Aki before we start the short drive home. 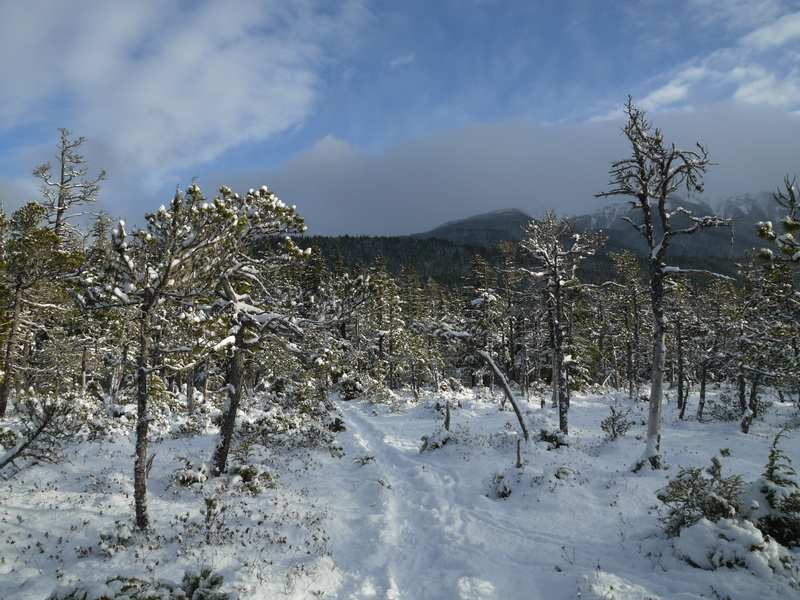 This entry was posted in Aki, Dan Branch, glacier moraine, Juneau, Kwethluk, Nature, Southeast Alaska on January 28, 2012 by Dan Branch. There is a magic moment when the sun first breaks through following a heavy snow storm to light up the whitest possible snow. 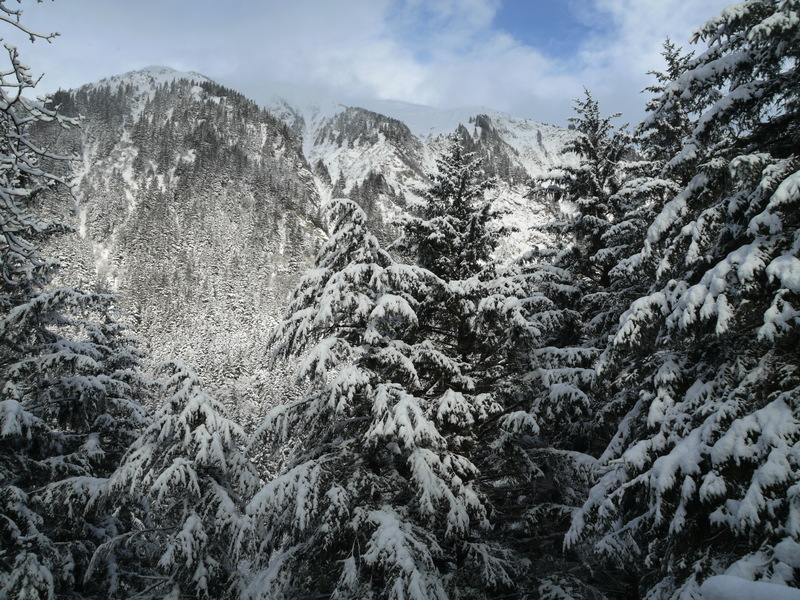 Today’s breakout came when several inches of new snow decorated tree limbs and tugged down the ends of spruce boughs on Chicken Ridge. A gang of ravens flew over the ridge then circling over my head. Was this, I wonder, payback from yesterday when I chased one of them out of our neighbor’s trash can? That bird followed me down the hill toward work until distracted by man collecting the garbage on 6th Street. Then I saw a second raven nestled into the soft snow atop of one of the totem pole faces. A camera would have been nice then. I brought one along when I returned to the place at noon but only found the raven impression he left behind. After work the snow falls straight down in flakes large enough to throw shadows on the white ground. State workers scurry home like people who believe they will turn into statues if they stop. They might. An inch of snow collects on my flat cap in the short time it takes for a long look down Main Street to the sea. 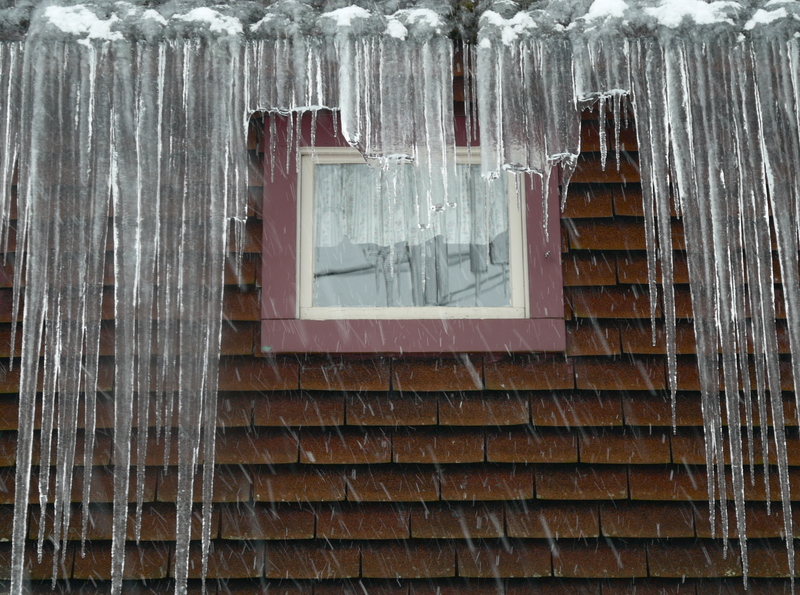 This entry was posted in Dan Branch, Juneau, Kwethluk, Nature, Southeast Alaska on January 25, 2012 by Dan Branch. Last night Aki’s other human and I enjoyed the Juneau Symphony’s performances of Rachmaninoff’s First Piano Concerto and a small piece by Franz Linzt. The drama of both prepared us for the near blizzard blowing outside the auditorium. It snowed steady all night. This morning it took an hour for me and the neighbors to clear an exit path off of Chicken Ridge. Looking for cover from the storm we headed to the forested trails on North Douglas Island. Here, as happens often, we find a break in the storm clouds that allows in the sun. Aki dives out of the car and rolls in new snow, one of her favorite things. Then she dashes down the old growth trail to the beach. Since it is more open than the Troll Woods, strong sunlight penetrates this forest to illuminate each flake of snow blown out of the canopy by a dying breeze. It is too beautiful to describe and too etherial to capture with my camera. I just stand there for a moment with that feeling you get as fine Swedish chocolate melts at the back of your mouth. Aki spends this time having another roll in the snow. Both saited by indulgence, we move on a muskeg bog where only ancient Bull Pines manage to grow among the berries brush. I call it the monastery meadow. I know they are just trees, these gnarled and stunted conifers. Their inability to compete with the faster growing spruce force them onto such marginal ground. While trees of the forest offer each other protection from fierce winds these pines stand alone and allow the wind to prune away superfluous growth. Today they rise, comfortably spaced over this berry patch as the sun melts away last night’s snow. If trees were sentient beings these pines would be their spiritual masters, life reduced to simplicity by wind and poor ground. Moving on we re-enter the old growth forest and walk to the ocean’s edge. Today’s 18 foot high tide has taken all of the beach, leaving us a small snow covered strip of grassland on which to stand. The water is claim so it reflects all the pinks and blues and grays of the sky, The scene is too peaceful to last and I expect a breaching Humpback Whale to break the silence but hear only mewing Gulls and the nervous song of Scooters. Looping back through the woods we reach the road from which you can see mountains on Admiralty, the large island just across Stephens’ Passage from us. Storm clouds move up channel in front of the mountains while more of the same have already climbed island’s ridge and will soon block Admiralty entirely from view. Flakes are already falling when we reach the car. 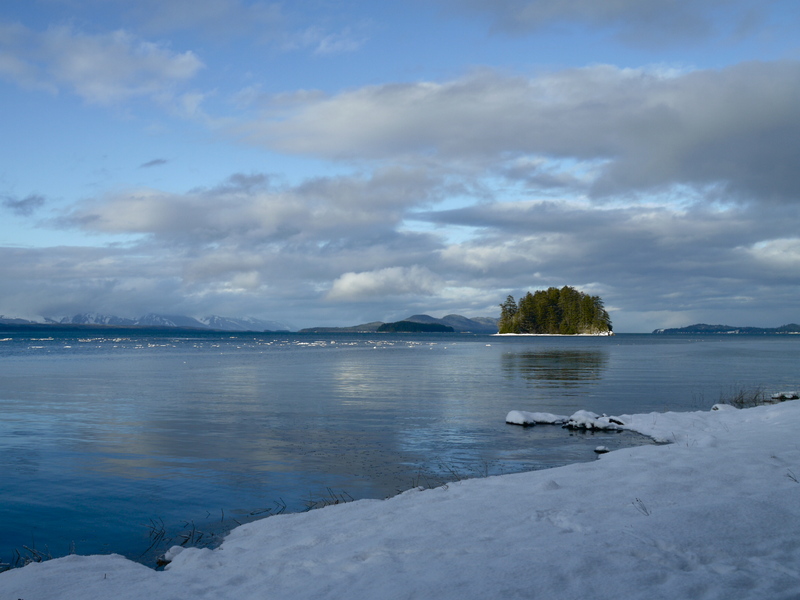 This entry was posted in Aki, Dan Branch, Juneau, Kwethluk, Nature, peaceful isolation, Southeast Alaska on January 22, 2012 by Dan Branch. We take a lesser use trail today through riverine woods until the road noise dies away and there is only silence. I hear a faint swishing sound and am surprised to find it is made by my jacket rubbing against itself when I move. When Aki and I stop so does all sound. 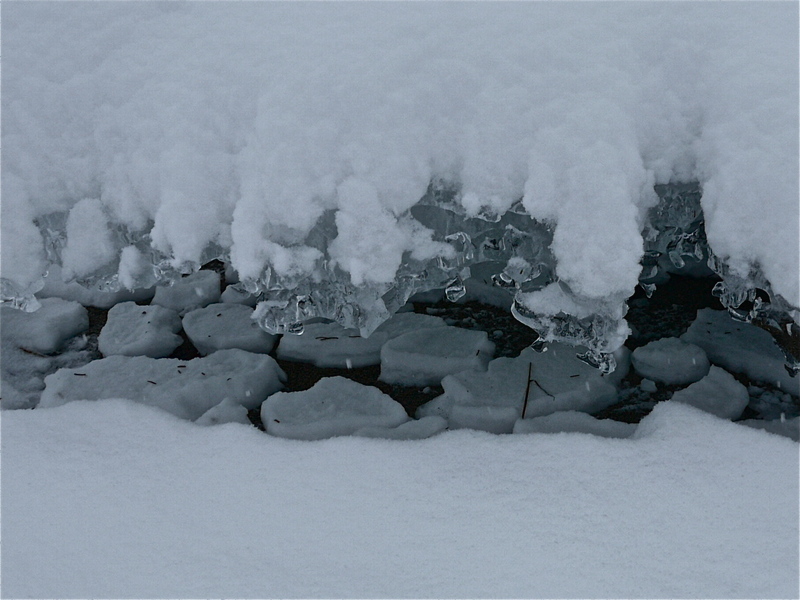 Usually the river can be counted on for a gurgle but our recent cold snap locked it down. 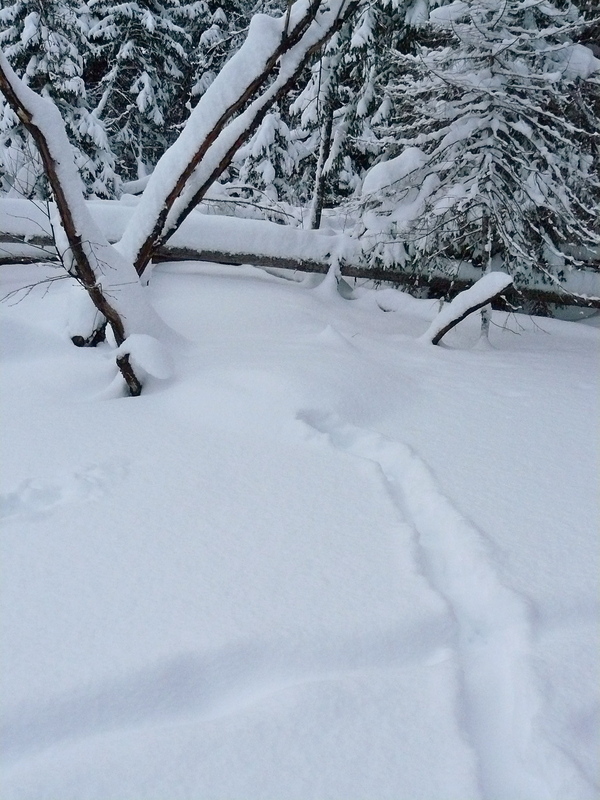 The wind storm that buffeted Downtown doesn’t bend and shake trees so snow finds its own path to the forest floor. Even the birds roost quietly out of sight. Profound silence is rare in this rain forest but it always blesses tundra on windless winter days if you stay off the main snow machine trails between villages. At another time of my life I’d drive a small team of sled dogs up the ice over twisting streams where no noise could reach. Then the the sound of their panting seemed deafening. Today Aki and stand completely still as I strain to hear if falling snow makes a sound striking the ground. It’s a foolish test that my ears fail. Aki’s canine hearing might pick it up but she won’t say. We must sound like a circus train moving up the trail for we see signs of animals that had dashed to cover just before we reach their location. We step over the freshly laid tracks of a snowshoe hare we scared away from a dinner of young willow. On the return trip I find where a deer hid in thicker woods for us to pass on the way up the trail. Later I puzzle over a 2 inch wide path trodden by tiny feet across the trail and then disappears into a snow bank. (A small bird or rodent?). When the trail takes us onto a muskeg meadow I hear what sounds like a jet engine and remember the wind and how the waves it drives onto a nearby beach during storm time can mimic a jet taking off. 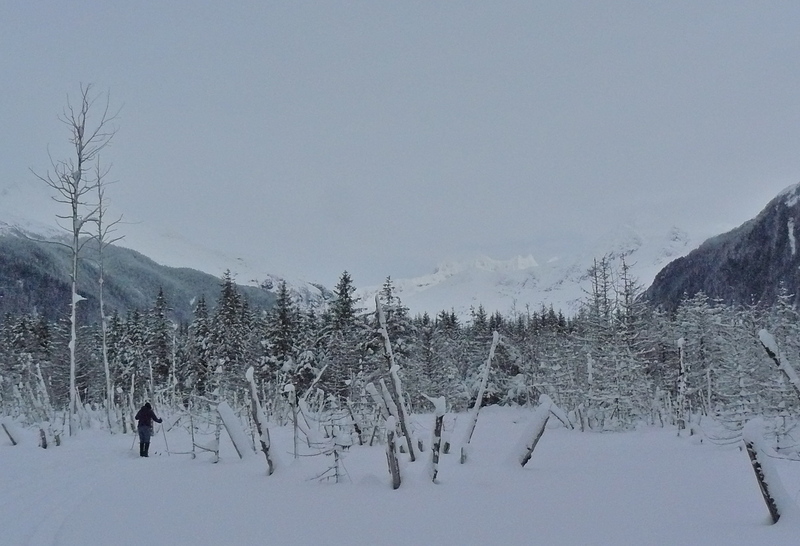 Leaving the protective forest we see and feel the effects of a north wind flying down Lynn Canal. There is the sound, now more clearly that made by storm driven breakers and there is the beauty of storm light on green seas toped with creamy foam. There is also the cold that we both feel. In minutes we turn around and head toward the car. 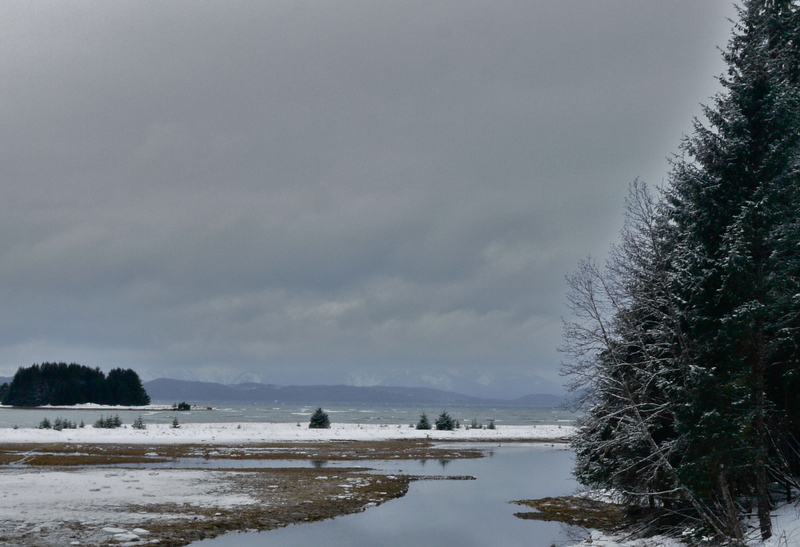 This entry was posted in Aki, Dan Branch, Juneau, Kwethluk, Nature, peaceful isolation, Southeast Alaska on January 21, 2012 by Dan Branch. It’s lunch hour and I am standing on a wharf completely open to Taku winds. From my office I could see a long line of almost surfable waves rolling up Gasteneau Channel, a normally calm fjord. This unusual surf drew me here. 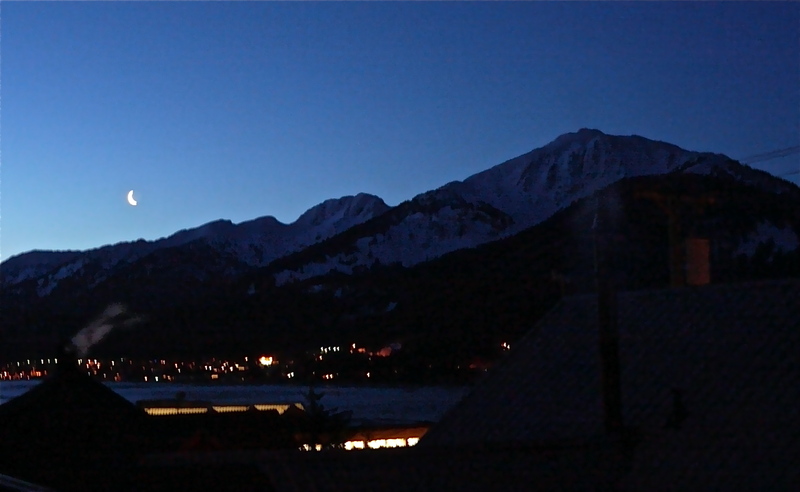 Just yesterday the morning broke clear enough to reveal the crescent moon rising over Douglas Island. Now it is all storm. No setting on my digital camera will allow it to capture there rollers coming right at me, let alone the wind’s sting. The straight lines of waves attack the boat dock below one after the other. As each expires there, it throws spin drift onto the dock where it will freeze to record the high water line of the storm. Farther down channel strong gusts of wind, maybe 50 or 60 miles and hour fill the air with water particles through which wind driven water devils twist to exhaustion. In the middle of this battle field a lone sea bird rises and falls on the waves. 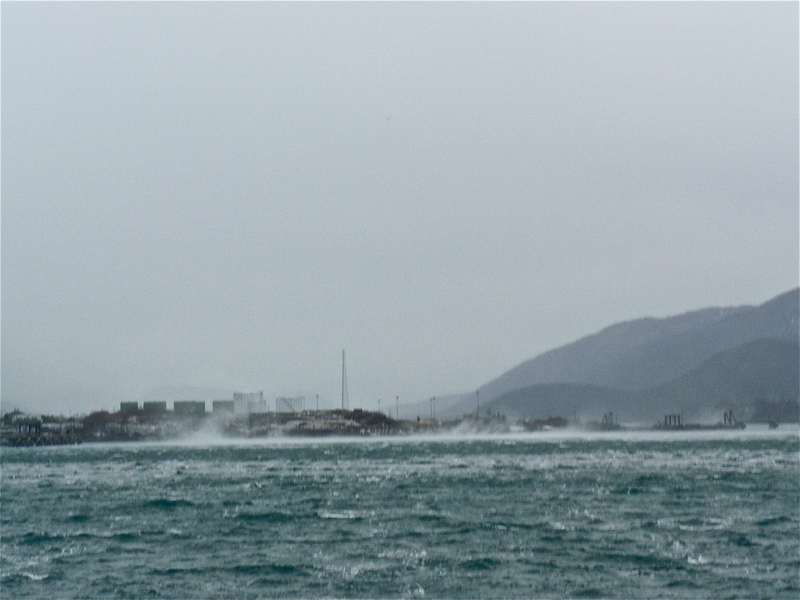 He is not bothered by the violent water but he should take notice of a small cloud of atomized seawater being driven toward him by a Taku gust. Just in time he dives beneath the channel surface to bob up after the micro squall passes. 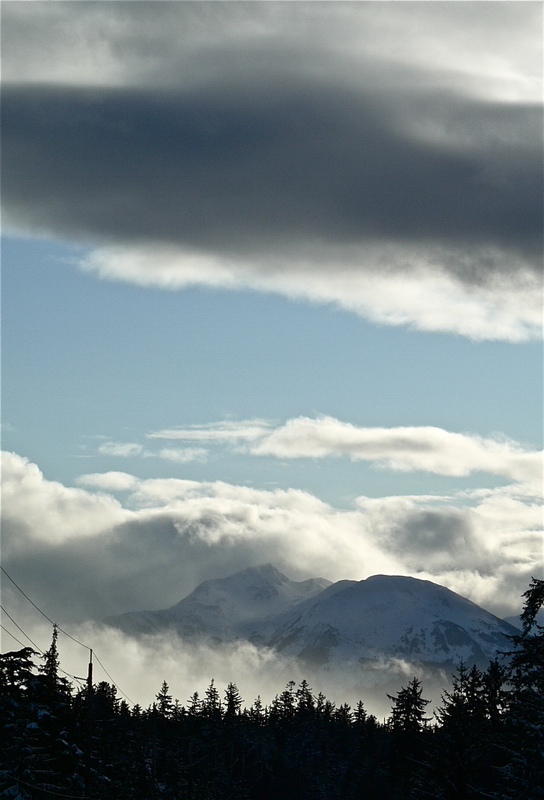 This entry was posted in Dan Branch, Juneau, Kwethluk, Nature, Southeast Alaska on January 20, 2012 by Dan Branch.